In the patient who presents with cariogenic shock, the cath lab and a stent or a CABG is probably the treatment of choice, however we don’t always have those luxuries. What inotrope(s) do we use in cariogenic shock? How do we approach those patients for the best outcome? Here is a recent case. It is evening in the emergency department and the ambulance alert us that they are bringing in a 65 year old male with chest pain, diaphoresis and a right bundle branch block on the ECG. ETA 10 minutes. At 5 minutes they call back saying they are headed in lights and sirens as the patient has dropped his BP to 60mmHg systolic post GTN. Whilst waiting I ask for an adrenaline infusion to be made up. Is this the right pressor to use? Do we know the right pressor? The patient arrives. He is diaphoretic and grey, with a blood pressure of 71/50. He is speaking in words and finding it hard to breathe with saturations of 90% on a rebreather. On auscultation, he has full field crepitations. He has no past medical history, is on no medications and has no allergies. In terms of his current chest pain, he had an episode of chest pain, two weeks prior that had self resolved. Earlier in the day today he had had a further episode, that had resolved and the current episode had started at 5pm. It was now 3 hours later. He had waited almost 3 hours with severe 10/10 chest pain before he called the ambulance. His ECG is handed to you. What do you think? I’m unsure. There’s a right bundle branch block. I believe that there is potentially ST elevation anteriorly with inferior reciprocal changes. There is also ST elevation in aVL. I think anterior STEMI. However its not clear cut. Why did he drop his BP? Was there a right ventricular component? The right ventricular leads don’t show anything. His chest X-ray shows significant cardiac failure. A quick cardiac ultrasound to ensure there is no pericardial effusion causing the hypotension and then call the cardiologist. The definitive treatment is cath lab, however where I work there is no cath lab in the public-only in the private sector. The cardiologist also had some trouble with the ECG, but given the chest pain and failure, the decision to thrombolyse was made. The pain score decreases to 1/10. He is placed on BiPAP and given frusemide. We still don’t have enough blood pressure to offload him with GTN and we are increasing the adrenaline infusion. 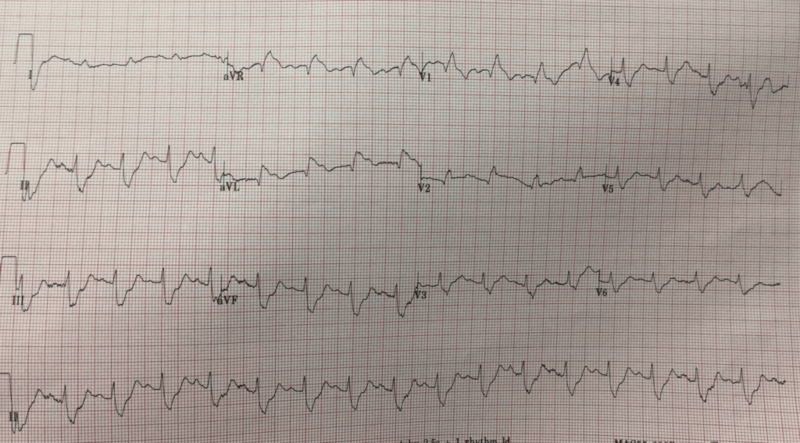 Over a short period of time his breathing improves, but his chest pain increases. He needs a rescue plasty. The adrenaline is now at 20+ mcg/min. A call is put to the receiving cardiologist at the Tertiary hospital. The receiving cardiologist agrees with the diagnosis of an anterior AMI. He believes we should intubate the patient and transport him. I know if I try intubating this patient, the patient will arrest, even with an awake tube, once I sedate and paralyse and he loses reflexes he will probably arrest. These patients are usually volume depleted and with a heart not working, it will be difficult. The retrieval services are called, but they won’t transfer as the patient is too unstable! So what do we do now? The adrenaline is at 30mcg and we’ve added some Dobutamine. Are we going to watch this man slowly die in our resus room? The retrieval services say its a ‘mercy’ dash and too dangerous. Isn’t that what a ‘mercy’ dash is? The patient needs a balloon pump short term and a definitive trip to the cath lab. Neither of which I have in my hospital. One more try. I call the cardiologist in the private and discuss the case with him. We decide that he has to go there. In the back of the ambulance and off we go. He gets a balloon pump and then a cath. He has 100% LAD stenosis, which is stented. The next day he is being weaned off his inotropes and looked better, however renal function continued to deteriorate and his pulmonary congestion did worst requiring intubation and transfer to a larger centre. The myocardial damage was most likely done in those 3 hours of chest pain. The chance of multi organ failure is high. Systolic Blood Pressure < 90mmHg or MAP < 65 for > 30 minutes or inotropes are required to achieve this. Our patient fulfilled almost all of these criteria. Is there is any evidence that one inotrope is better than the other in cariogenic shock? There are no clear guidelines for the use of inotropes in cariogenic shock. There are some consensus guidelines(1). However we don’t tend to use these last three as much in the emergency setting. Perhaps NorAdrenaline is the best way to start. It increases cardiac index and mixed venous oxygen saturation, without an increase in heart rate or lactate(2). Adrenaline can provide similar improvement however it tends to increase heart rate, which increases work done by a sick heart and lactic acidosis(3). Dobutamine is a further option, it results in less arrhythmia, less myocardial oxygen consumption, and a lower increase in lactate concentration(3). Consider starting with NorAdrenaline which had both alpha and beta effects and adding Dobutamine if needed. The diastolic blood pressure can help us in making this decision a pressor. Low diastolic blood pressure in the absence of bradycardia, indicated decreased arterial tone and the need for support. Is there a role for a Balloon Pump or ECMO? The SHOCK II Trial(4) which was a multi-center randomised trial, showed no statistical difference at 30 days between those on an intra-aortic balloon pump and the control group. The recommendation is that peripheral extracorporeal membrane oxygenation is preferred for use, however, where this is not available and revascularisation is by thrombolysis, the balloon pump can be used. Recognise the sick patient and start peripheral pressure support as early as possible. Remember that Adrenaline and NorAdrenaline can be run through a large bore IV cannula in the cubital fossa. The most important thing to do, is to recognise the hypotensive patient. Levy B, Perez P, Perny J, Thivilier C, Gerard A. Comparison of norepinephrine-dobutamine to epinephrine for hemodynamics, lactate metabolism, and organ function variables in cardiogenic shock. A prospective, randomized pilot study. Crit Care Med. 2011;39(3):450–5. Thiele H, Zeymer U, Neumann FJ, Ferenc M, Olbrich HG, Hausleiter J, et al. Intra-aortic balloon counterpulsation in acute myocardial infarction complicated by cardiogenic shock (IABP-SHOCK II): final 12 month results of a randomised, open-label trial. Lancet. 2013;112(9):1367–72. Will Paramedic-2 change my practice? Good Question. No great evidence for BiPAP over CPAP. I didn’t mention that his GCS was heading downward a little and the CO2 was rising a little ( no known COPD) although not greatly increased. That’s all. I wanted to assist his work of breathing. He seemed to spark up with it. Could have used CPAP.